Business Process Management (BPM) is a discipline which uses various methods and practices in order to discover, model, analyse, measure, improve, optimize and automate different business processes. * Simply put, it represents a systematic approach to making an organization’s workflows more effective, efficient, agile and capable of adapting to an ever-changing business environment. Thus, it is not only a one-time task, but rather an activity that involves constant and continuous process re-engineering. BPM as such, is used on an ongoing basis for an overall business process improvement. Why and How Do Companies Use BPM? Process management is used by many companies as a crucial, strategic success factor to analyse core competencies and key processes and to optimize them to the respective requirements. More precisely, process management provides you with the tools to develop and evaluate business models, increase efficiency and provide your customers with an exceptional customer experience. What is the Best Way to Get Started in BPM? While realistically there is no one right way to get started in BPM, there are some guidelines that will make your life a lot easier. BOC Group offers 20-plus-year-long experience in this field and provides you with their best practice model on how to best manage BPM in your company, in order to achieve the desired results. What’s more, we also share with you the steps which need to be taken, to be able to succeed in process management and to establish a suitable and sustainable process management system. Finally, we not only provide you with the means, but also the tools with which you can get your BPM initiative under way. BOC Group offers multiple variations of its BPM suite ADONIS NP, ranging from the free ADONIS:Community Edition, to ADONIS NP’s professional editions. Therefore, everyone interested in BPM, teams and companies of all sizes, can surely find something suitable and fit to their business needs. What is BOC’s Recommendation for Tackling BPM? Because framework conditions and corporate goals are subject to constant change, business processes too ask for continuous reviewing and adjustment, to be able to follow, reflect and evolve in line with those changes. Due to this continuous effort, we recommend using a cyclic procedure model – such as the Process Management Life Cycle – for tackling BPM holistically. The Process Management Life Cycle is designed to allow for a constant and unceasing improvement of processes throughout the company and the extension of best practice approaches. Thanks to its flexibility in application, the life cycle allows addressing small-scale BPM implementation projects, as well as enterprise-wide re-organization programmes alike. What’s more, its phases can be freely applied, re-visited or skipped, depending on the requirements at hand. The life-cycle itself revolves around all sorts of assets, that constitute and make up an organization (organizational units, IT systems, SOPs, risks, etc. ), which themselves form important entry points to further management scenarios. 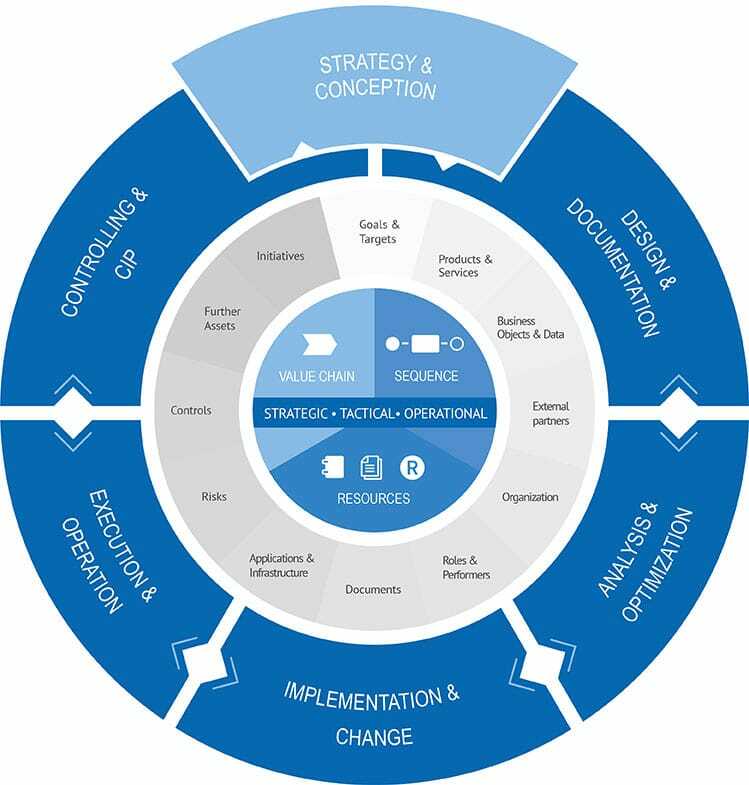 Therefore, with the Process Management Life-cycle, BOC Group does not only address the standard getting started topics, but also topics with a higher degree of maturity (e.g. process controlling) as well as more advanced scenarios in the context of BPM (e.g. Quality Management, ICS, etc.). Ready to Come and Take a Closer Look? Also be sure to check out our “Getting Started with BPM” webinar to deepen your insights and learn more about our best practices, with the help of our BPM experts.